When did I first teach a learner novel? Hmm, think back. From about 2011 through 2014 I taught only intermediate and pre-advanced students and/or the very littles: preschool. I’m pretty sold on the complexity, grit, culture and authenticity that infuses the classroom when you teach an authentic novel as soon as learners can handle it (with a guide, about intermediate mid). And, of course, my littles were getting my simplest stories and significant adaptations of the likes of The Very Busy Spider. The 2014-2015 school year I was just figuring out how to be a homeschool mom of three kids under 6, including my exhaustingly gifted five-year-old first-grader. Mostly I figured out I needed help. Enter my alliance with a homeschool co-op, a group of homeschool families who meet once a week for structured learning based on what they’ve done at home all week. It’s been a win-win: my kids got a break from me, and I got to feed the part of my soul that’s only happy when I’m teaching Spanish. And this time, I was back with beginners. Real beginners. No-measurable-proficiency day-one beginners, from ages 10-18. At first, I did what I’d done for a long time: I designed my own units, figured out all their at-home activities myself, designed most assessments myself. What does that mean? It means I was super stressed. I rarely went to sleep Thursday nights before 1:30 a.m. I still needed help. That’s when I decided to try a novel. I’ve been a friend and fan of the authors involved with Fluency Matters for a long time, since I got to room with some of them at a Central States Conference ages ago. I’ve interacted on Twitter with the authors and the teachers teaching them. But I’d never actually taught one, and I’d only ever read one or two. Until two years ago. Framing a novice unit within a novel and its primary themes was one of the best decisions I’ve made in the last few years. It was me letting the PLN make my simmer sauce. There are some I love and some I’m indifferent on, and some that are not for me at all, but for my middle grades, Craig Klein‘s books have been a true gift. Once we’d gone through El ratón Pablito, I thought they were ready to tackle something with a little more of a plot. We chose Peter va a Colombia. Spoiler alert: Craig’s made a significant edit to this novel and I for one can’t wait to see it! He’s fixed some issues he didn’t like about the book and I think you’re going to love what he’s done. All my resources below are for the first edition; if you’re using the update, you’ll need to move things around or get rid of them altogether. From Botero to beaches, from giant shoes to fruit-laden jeeps, we had a great semester exploring Colombia and I’m thankful for Craig’s work as a frame for us. If you’re contemplating teaching this novel, let me offer you the schedule we used. I developed this syllabus for a class of 5th-7th graders meeting once a week for 60 minutes. On weeks we were advancing a chapter or two, we read that material in class, usually acting it out, and did other activities to preview or otherwise highlight the themes and language in the chapter. Then, students did activities at home and reported or turned them in via Edmodo until the next class meeting. If we had read a chapter in class, these activities always included reading the chapter again at home and answering comprehension questions. Often, learners also completed a “Take Your Pick” activity of their choice. Other assignments are listed below, with links if applicable. Reread chapter 1 and students fill in what they understand about Peter’s daily life. Video: “Qué le gusta” – Lola Aventuras and another Lola compare their likes. Use this ficha to have learners show what they understand. Complete the story: “Las vacaciones de Omar” has learners choose options and fill in the blanks – this is a strategy that was a winner all year. It got sneaky repetitions of the chapter’s language in, and kids had fun coming up with new stories. Sing the Days of the Week. Report the activities in a typical week. Review clothing set in Quizlet. 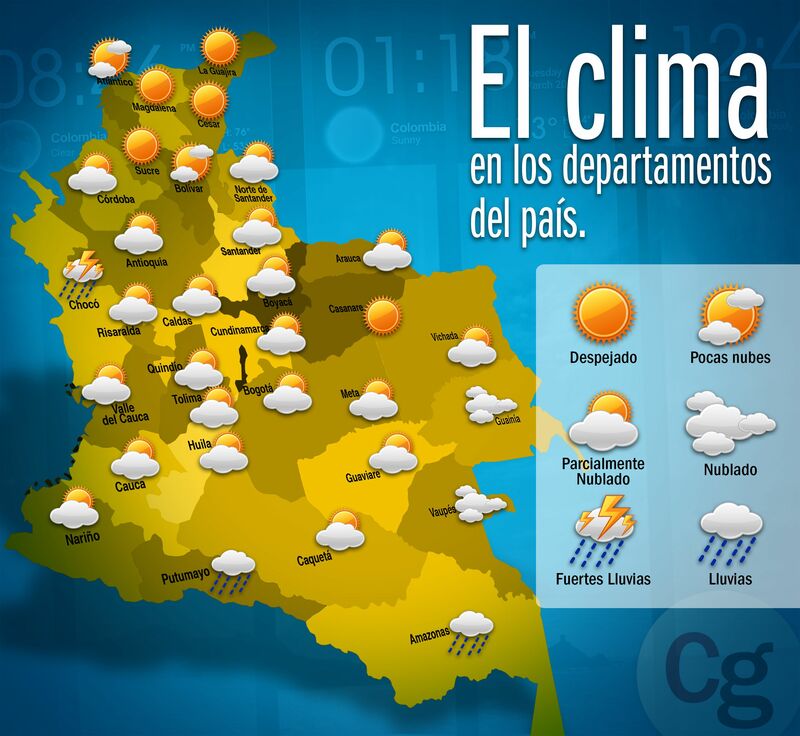 Use the weather phrases to report the weather in 5 cities in Colombia. Review the travel Quizlet set. Compare Bogotá’s weather to ours. To express prices, review this song on numbers by tens and this Quizlet set on the numbers by hundreds. Then prepare a tentative budget here. Complete and re-read Carolina’s minibook Viva Colombia. Learners share 3 things they learned about Colombia. Listen to the song Internacionales and fill out the activity sheet from Kara Jacobs. Complete plane ticket information on itinerary. Use Delta’s Spanish site and provide the fecha de salida, fecha de regreso, and precio. Planning: En mi maleta (draw the maleta and the clothing inside as a picture of words- thanks for this idea, Debbie!– e.g. the suitcase is the word maleta written over and over so the word forms the shape of a suitcase). Students used an attached weather forecast for Cartagena to plan what clothes to bring. On your itinerary, complete Day 1 by choosing which cathedral, museum, and park you will visit in Bogotá, based on authentic reviews from TripAdvisor. Look at this article, choose 5 animals in Colombia, give a short description or tell something learned about them. “This commercial is for a store in Uruguay in the Christmas season. Use the phrases you know for clothes and weather to tell what the weather is frequently like in Uruguay around Christmas and what clothes people use there. Lleva (he/she wears) ___________ porque (weather phrase) (how often). Can you tell me anything else about the clothes they are wearing in the commercial? Learners used this chart to tell what the weather is like at a certain time of year in our city. They tried the last part about what the weather is like in Bogotá and Cartagena. Constrast: el pueblo y el campo using resources from Participate’s lesson on this topic in their Spanish 1 course (which I collaborated on). Learners had categorized 10 words from the list from Participate as ciudad or campo. At home they categorized any 10 more words. On the itinerary, complete Day 2, Pereira. On the itinerary, complete Day 3, Cartagena. 2) How many (%) beach visitors lodge in a beach house? 3) What is the most important factor Mexicans think about when choosing which beach to go to? 4) At the bottom right, what is the number 41% referring to? Do you agree? 1) What is the team’s nickname? 2) What was the average income (ingreso) per person at the time in Colombia? 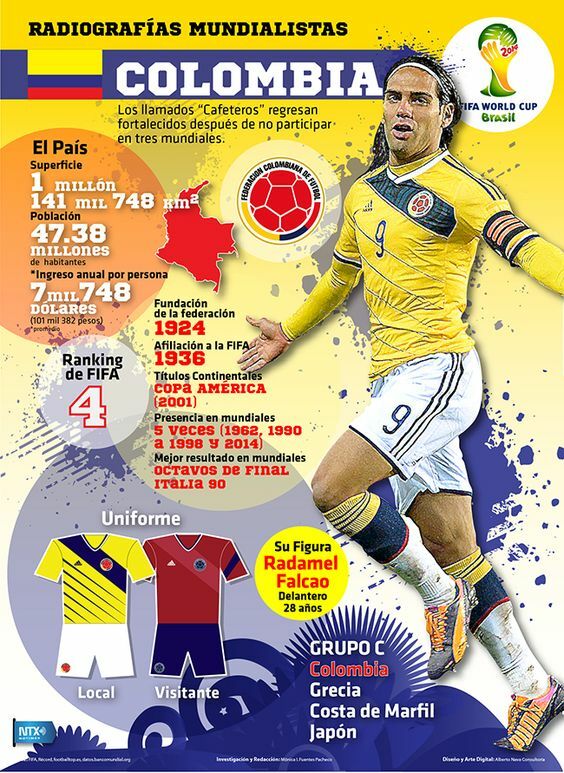 3) How many times has Colombia been in the World Cup? 4) Name the colors of their home and visitor uniforms en español. 5) Name another country in their assigned group. 6) Now investigate: Will/Did Colombia play in the (2018 World Cup in Russia)? 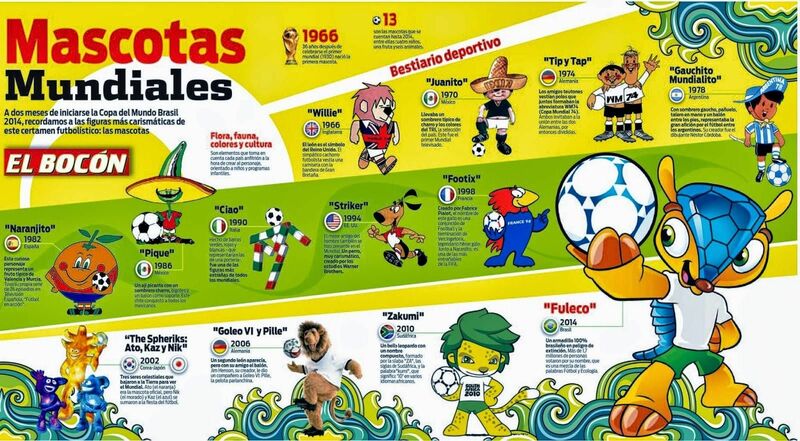 Look at this infographic, choose a favorite mascot, and explain why it’s the favorite. In the trip itinerary, complete Day 4: Santa Marta. Read Julie’s coloring book twice (coloring optional). Learners report 3 things they learned about the Biblioburro from these resources: this graphic story, the first section of this article, and this video. Review conversation circle questions and prepare to present itinerary. 16 Itinerary presentations, conversation circles All done! My learners made yipao centerpieces for our family dinner & display night using Craig’s template. One note of brutal honesty, I didn’t give clear directions on what “present your itinerary” meant, and clearly these middle-grades kids weren’t experts yet on what a presentation was even about. The so-called “presentation day” turned out terrible. I got some of them to kinda sorta read what they’d written so they could pretend they’d done a presentation and I wrote off the assignment. It was one of my biggest fails that semester. With middle grades learners, if you’re going to ask for a presentation, model it, ask others to model it, model it again, and give the clearest rubric ever. And break it down into pieces they complete a bit at a time. As I contemplate this year, I’ve got three novels on my mind. My younger class has requested a Bolivia story (thanks Maris for your El Ekeko simmer sauce!). My high school girls are taking a semester off of novels to pilot my PBLL unit “Coffee, Culture, and Fair Trade,” but I may have them read Noche de oro on their own because they loved Robo en la noche last year. Spring is up in the air in both cases, but for the older class I’m contemplating pushing their proficiency with Vida y muerte en la Mara Salvatrucha so we can get into some really heavy current events. Are you teaching a novel this year? Share your simmer sauce, and I’ll keep sharing mine! If Musicuentos has significantly helped you in your language teaching journey, consider becoming part of the “thanks” crew on Patreon. “La lotería” patrons receive every resource I produce, whether it’s a $2 activity or a $50 ebook guide, as thanks for their sponsorship. What an incredible resource! I so appreciate you sharing! My students are going to love every minute of reading this novel! Great, I can’t wait to hear about it!